Japanese gamers always get the coolest stuff. Sony is poised to launch a new Vita bundle alongside the March 2013 release of Soul Sacrifice in Japan. 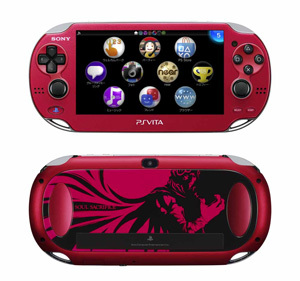 The bundle includes a Vita with a new Cosmic Red finish, matching earbuds, red-accented carrying case, and of course the Soul Sacrifice game itself. Unfortunately, while the Soul Sacrifice has been confirmed for a broader worldwide release, there's no indication that the bundle is headed for anywhere other than Japan. Soul Sacrifice is the upcoming action RPG from Mega Man creator Keiji Inafune. The title has already gained a good deal of attention for its dark, gritty art style and its interesting take on co-op gameplay. The game does not yet have a firm release date for North America or Europe. Japan has a history of getting custom consoles that never find their way to other territories, and although there's still a chance that we could see the Soul Sacrifice bundle make its way west, we're not holding our breath. The Soul Sacrifice package will carry an asking price of Â¥29,980, which is approximately $365.